Traveling cat spotted on the dog cemetery Cimetière des chiens in Paris, France. Great picture. We saw cats that the cemeteries in Paris, too. They looked like they were pretty healthy and well-fed. Wow! Gorgeous cat, clearly a gorgeous cemetery too! Et là c'est beau ... un chat là où repose un chien. And that cat probably put him in his grave. Oh that's a nice shot! Very sweet. Have a tremendous Thursday. 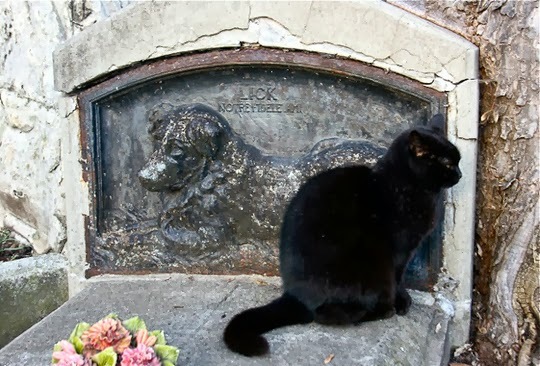 That looks like a very old grave and the cat looks very content sitting there. Such a beautiful black kitty! Aww, beautiful, beautiful photo. The cat has such a plush, shiny coat. I just want to scoop him up! Don't be jealous kitty, at least, you're alive! (nice picture). Hmmm...so maybe he killed the dog? I like how the cat's back is turned away from the dog, lol. To me, it suggests that the cat could be missing a canine friend. Awww. Resting her tender paws. Pretty cat and with shining fur. Oh! I didn't know there was a doggie cemetery in Paris! That's a lovely picture. Kitty's who travel well who knew? Now that's ironic. =O) Great shot! Black cats are the best! Thank you for a beautiful picture.